Blade, by his nature, does not seem like a joiner. However, history has shown us the aphorism of not judging a book by its cover applies to the Daywalker. Despite his disposition and his presentation, Blade has proven to be an accomplished and reliable ally. In AVENGERS #16, on sale Wednesday, March 6, he demonstrates once more that when the going gets tough, Super Heroes can count on Blade – if by “going gets tough” you mean “vampires have gotten involved,” of course. 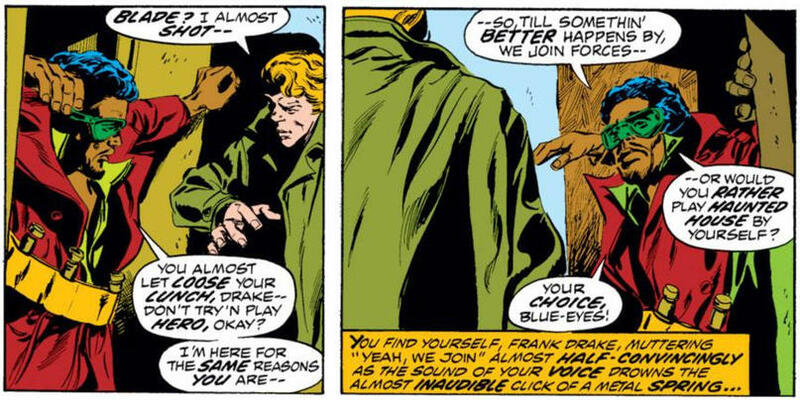 While we wait on tenterhooks for the Daywalker to start slaying vamps left and right, we here at Marvel.com are revisiting some prior Blade alliances. Shortly after Eric Brooks gained the nickname Blade for his proficiency with, well, blades, he joined up with the street gang/monster hunting team called the Bloodshadows. After Blade slayed the group’s leader Cyrus Cutter, he took them abroad. Unfortunately, after early success, this choice proved to be their doom. Nearly the entire team ended up killed except Blade’s girlfriend Glory Anah. Glory, alas, suffered the even less pleasant fate of being turned into a vampire herself. While in pursuit of Dracula, Blade chased the vampire to the City of Lights. While there, he encountered Quincy Harker and his allies, Frank Drake, Taj Nital, and Rachel van Helsing. While Blade’s attitude often made their alliance rather rocky, they nonetheless worked together several times against Dracula and the vampire’s allies. Frank Drake and Blade would continue to work together, eventually hooking up with Doctor Strange and the vampire detective known as Hannibal King. Despite some early friction between Blade and King, the quartet proved an incredibly effective on-again, off-again collaboration. After the Montesi Formula temporarily rid the globe of vampires, Blade, King, and Drake decided they had such a good thing going on that they opened a detective agency together, Borderline Investigations, Inc. Most of their work revolved around the supernatural and suspected supernatural, as you might guess. Eventually, Borderline shuttered in the wake of Blade going to a mental institution after a harrowing battle with the resurrected Dracula. 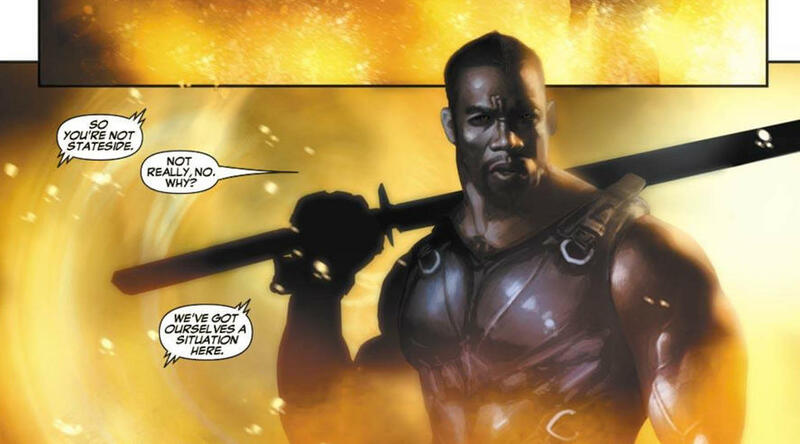 Doctor Strange stepped up for his former allies soon after, however, and sprung Blade from his locked ward. King, Drake, and Blade reconnected once again and christened themselves the Nightstalkers. While theoretically focused on any and all supernatural concerns, they were largely consumed by opposing the demon Lilith and her various machinations. Once again, tragedy would tear them apart, this time upon the revelation that their friend and ally Taj Nital had been turned. Reeling from this loss after stopping Nital, the trio proved easy pickings and both King and Drake appeared to be killed in their final mission. Time heals all wounds, even for partial vampires like Blade. When the Daywalker found himself unexpectedly swept up in Civil War, he saw an opportunity and went for it, reasoning that being part of a team might be worth it again. Registering allowed him to join S.H.I.E.L.D. which, in turn, gave him access to amounts of resources far beyond anything he had had before. Unfortunately, the alliance made Brooks overconfident and a spell he expected would give vampires back their souls instead returned every vampire he had ever killed to life. Despite the monumental disaster after teaming up with S.H.I.E.L.D., Blade still ended up with a massive budget to run a black ops team known as the Vanguard. Things went belly up in a hurry when police detective Stacey Dolan became aware of the team’s existence. Blade’s teammate Colonel America decided that in order to preserve the secret of Vanguard, he’d have to kill Dolan and every other member of the Vanguard. Thankfully, Retcon’s abilities enabled the team to go into hiding while the Colonel remained convinced that he had killed them and protected Vanguard’s secret existence. Perhaps deciding that remaining in America was not worth the effort, Blade departed for his native land of the United Kingdom. He quickly joined up with Britain’s Super Hero espionage team. It proved not a moment too soon since Dracula shortly thereafter attempted to destroy the whole Empire through a series of complex machinations. 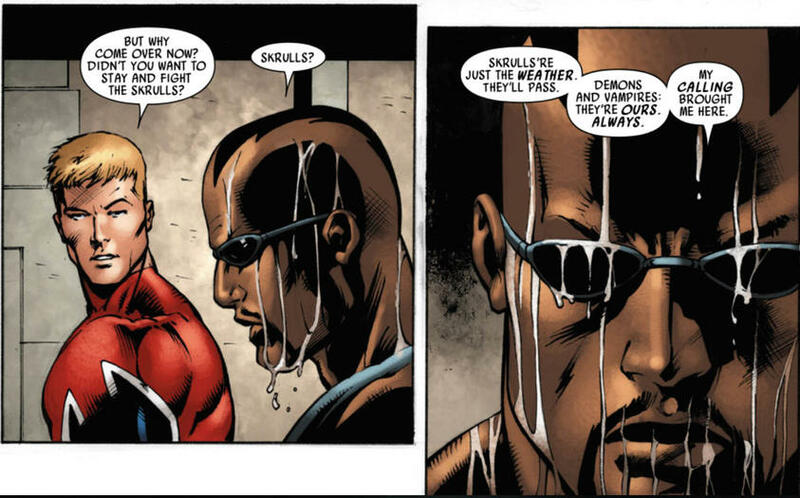 Thankfully, the team, including Blade, managed to stay one step ahead of the Lord of Vampires. Dracula’s conquest attempts amounted to nothing but ash and retreat. Beginning as Spider Hero and then Ronin, Blade sought out Spectrum and the Mighty Avengers to aid him in a mission. However, it was a partnership based on timing and immediate needs more than anything else. 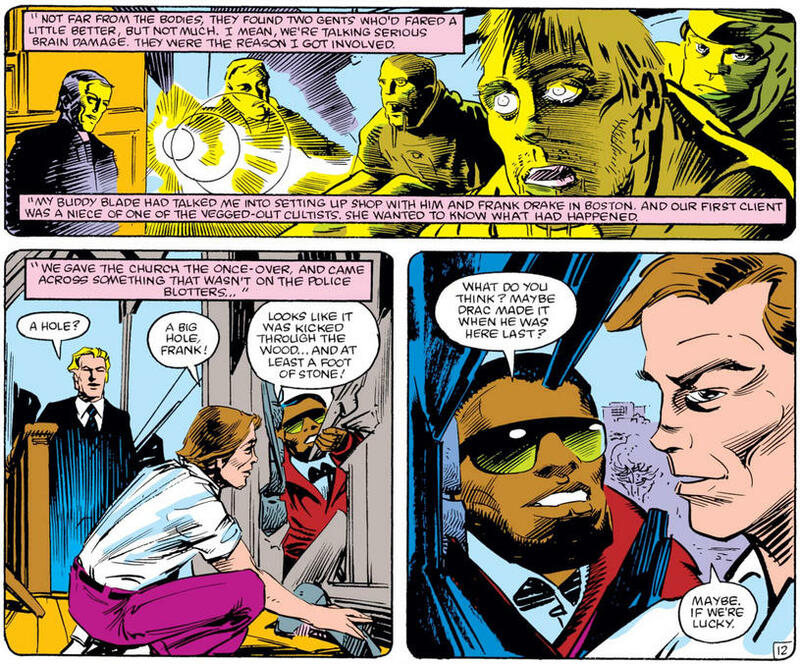 The various costumed identities intended to let Blade keep a low profile until they could help him with what he showed up for in the first place. Eventually, the Deathwalkers did catch up to Blade and use him in their dark ritual. The Mighty Avengers, however, paid back his teamwork in kind by showing up and becoming a combined being called Avenger Prime that easily took down the spiritually not in sync Deathwalker Prime. 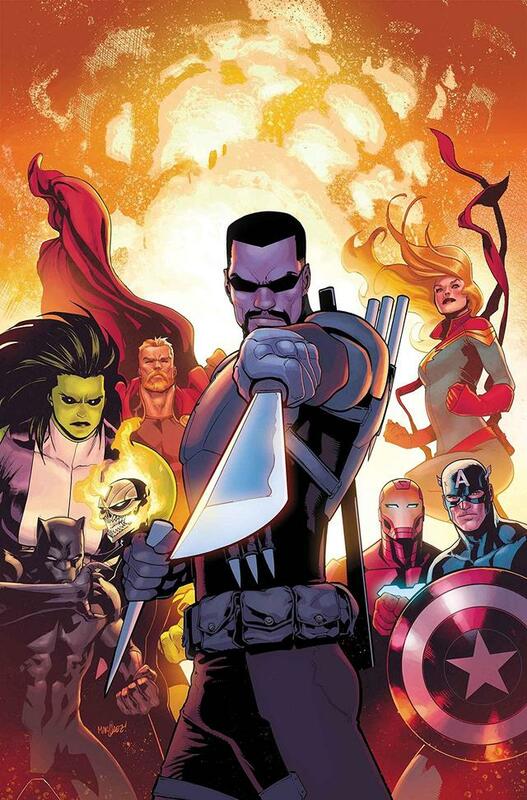 You can read about Blade’s latest partnership with the Avengers in AVENGERS #16, written by Jason Aaron with art by David Marquez, when it goes on sale Wednesday, March 6. Pre-order your copy today online or at your local comic shop!